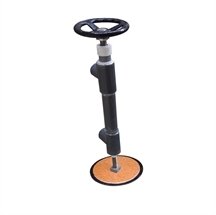 Consists of Non Corrosive Hand Wheel, 1" Sleeve Pipe, 2" Schedule 80 Tee, Fiberglass Threaded Rod, 9" fiberglass disc and 10" rubber disc and nut. 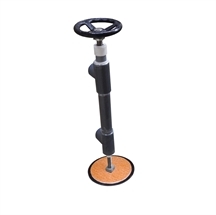 Consists of Non Corrosive Hand Wheel, 1" Sleeve Pipe, 2" Schedule 80 Tee, Fiberglass Threaded Rod, 11" fiberglass disc and 12" rubber disc and nut. 7 3/4" diameter. Nylon Construction, Non Corrosive, with Stainless Steel hub. For use with all Vak Pak Spin Valves, old or new style. Threaded high tensile fiberglass shaft. For use with new style Vak Pak spin valves. Attaches to handwheel and disc using allen screws (not included). Assembly includes sleeve pipe, schedule 80 2" tee. For replacement of Vak Pak Spin Valve units, both old and new style. Ship weight 3 lbs. 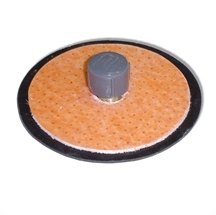 Includes base fiberglass disc, 10" rubber disc, 9" fiberglass disc, rod socket, and threaded attachment knob. 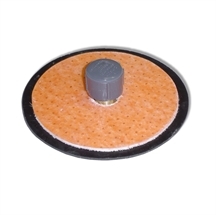 Includes base fiberglass disc, 12" rubber disc, 11" fiberglass disc, rod socket, and threaded attachment knob.